When protesters pull out weapons of war it’s time for the police to start shooting. 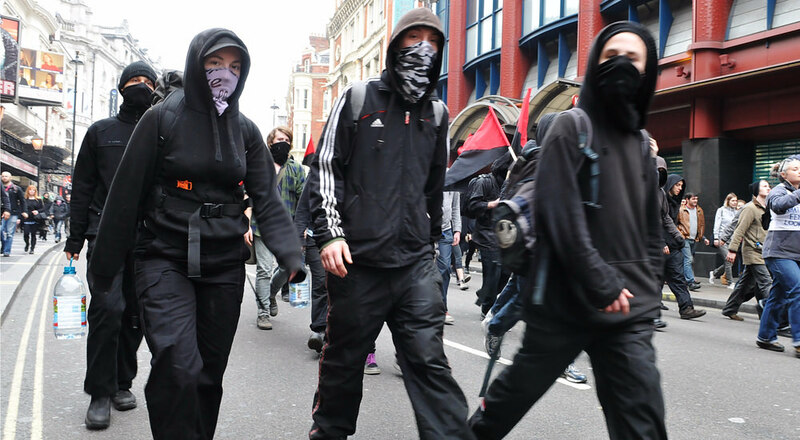 This isn’t protesting – this is assaulting police with deadly weapons. This is not just liberal horsesh*t, but a clear cut case of liberals backwards thinking based on leftwing fascist terrorism. You have never seen and will never see this at a TEA Party protest. This has Hitler’s Brown Shirts/Obama’s Black Hoods painted all over it. The only people perpetrating these acts of terror are not doing so as patriots fighting oppression, not anarchists that want government to be broken down, but fascist terrorists fighting the protectors of lawful citizens to overthrow America’s rightful leaders – i.e. they are DEMOCRATS! Anarchists are just criminals who want to be free from police protection of citizens so they can run rampant. Terrorists have a political agenda to overthrow the lawful government and establish their own tyranny. Obama’s Black Hoods follow the ancient Islamic way of the Jihad when weak to disrupt society by claiming oppression so they can breakdown resistance to their corruption and overthrow the government. Marx understood this, Hitler learned it, and Alinksy wrote the book on what they all learned from the teachings of Muhammad. This is how liberal fascists seek to deceive and terrorize the righteous in order to establish the tyranny of the Left. NEVER LET THE LEFT NAME THE GAME! Police should have snipers on rooftops with shoot to kill orders if they even see an open flame in a crowd of fascist protesters. Liberals shoot off fireworks to stun and desensitize police to the bangs until the time comes when they bring an active shooter like they did in Dallas. This warfare on police by criminals and terrorists cannot be tolerated by a civilized society. Citizens are getting frustrated and personally fighting back. They are getting disgusted with these Democrat mayors and governors who not only allow these protesters to harm police, but to block traffic, run riot, loot and burn, and not just make life hard for the good people of this country but to terrorize them into submission. Several drivers have run these people down and are being prosecuted by Democrat’s corrupt judicial system when it is the protesters, rioters, and fascists that should be prosecuted and put away forever. Americans will not tolerate the Left inviting foreigners to invade and take their jobs, provide welfare for these violent deadbeats to buy drugs, and allow them to terrorize the people. President Trump needs to put an end to this by locking up police chiefs, sheriffs, mayors, and governors who are violating America’s immigration laws and anti-terrorism laws. States and cities do NOT have the right to determine America’s national immigration law. “No human is illegal” is their idiot mantra, but committing crimes are illegal and human beings who do so are criminals. These criminals, thugs, and corrupt government advocates need to be ejected from America and banished for life! They are exercising their “freedom of the press” to post propaganda claiming President Trump is limiting the freedom of the press because he refuses to help them promote their anti-American propaganda. The Left is the people who are trying to crush the 1st Amendment and the Constitution. Freedom doesn’t mean freedom from prosecution for committing crimes and violating the rights of the America people. Democrats are not Americans, not patriots, but fascist terrorists working for the overthrow of the Constitution. And they are doing it through deceiving the ignorant of their true, yet obvious, intentions. American Jihad – Vote Fascism or Die!